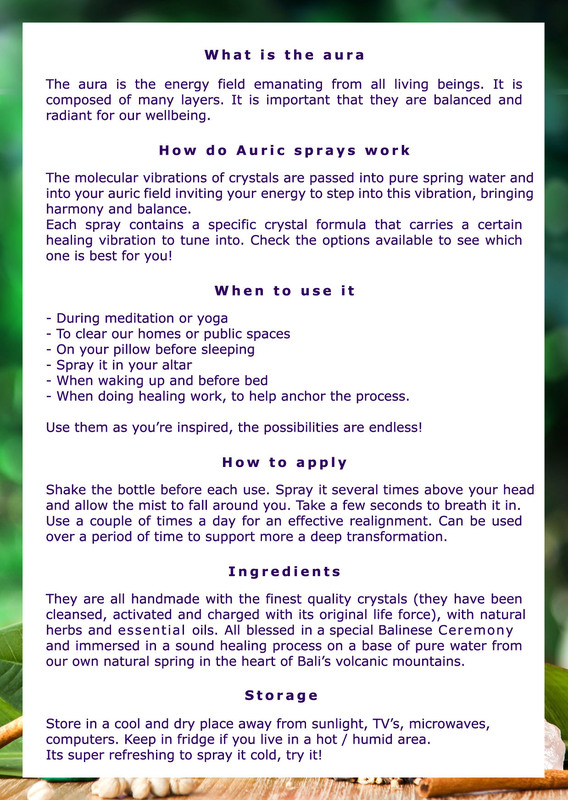 This Auric Spray helps release unwanted emotions, habits, fears and attachments. Our energy field has a certain capacity and volume. Certain quantity of information and experiences can be held in our energy field. There is need to make some space in it by releasing things that have already been processed in order to have more space for new things to come. 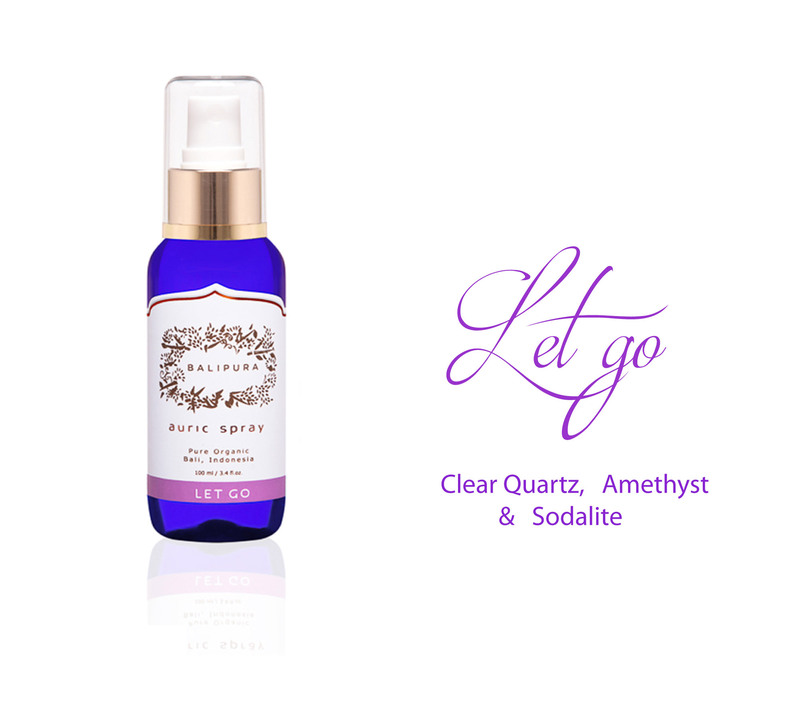 Let Go – 100ml / 3.4 fl.oz. PRE-ORDER: SOLD OUT please email [email protected] for exact times of new delivery. All our products are made with Pure Ingredients and Certified Organic Essential oils. 100% Handmade in Bali with love and intention. 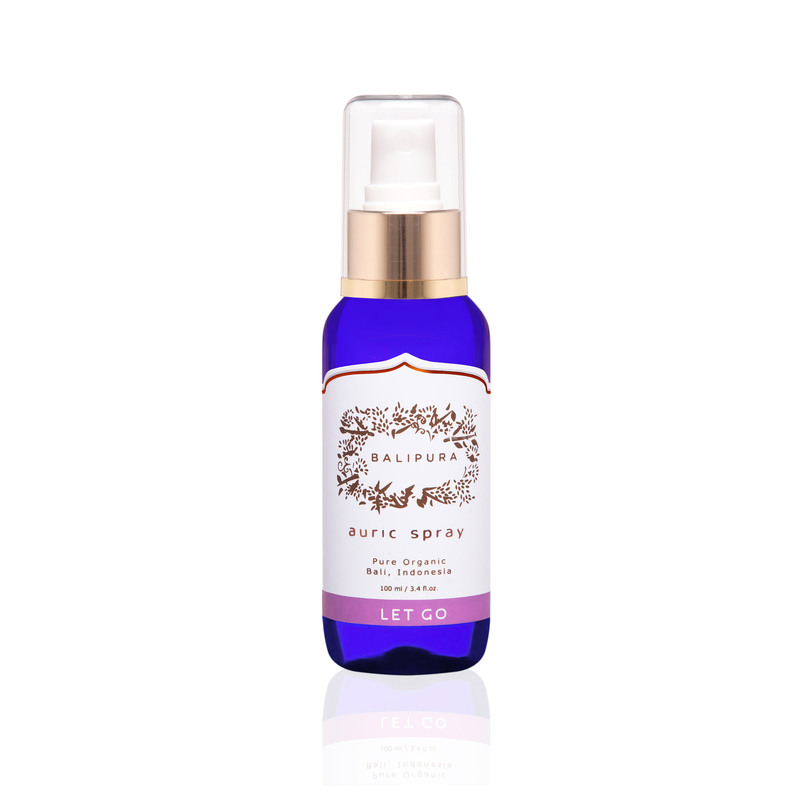 Our products are all handmade with the finest quality crystals, Certified Organic Essential oils on a base of pure water from a natural spring of one of Bali’s revered volcanoes where the water is fully charged with its natural life force. The water (Tirta) is very important to the people of Bali, one of the most important sacred objects (together with flowers) used in everyday Balinese life. Crystals used go through a thorough cleansing protocol of sun and moonlight, and seawater and rest. Cleansed, programmed and activated to recall their natural life force and to attain the Sprays’ objective. Balipura water is cleansed by a UV Water purification system, which takes away 99,9% of harmful micro organisms, avoiding the need of chemicals or heat. It also goes through a process of energetic cleansing. The water is then infused with Balipura Transfer Method™, where the water is never in direct contact with the Crystals, but infused through a process that multiplies the energy making it several times stronger than direct infusion. The infusion rests under the phases of the moon for a number of days. Energetic Healing and Sound & Vibrational Healing are applied. The production process is finished with a special Balinese Ceremony performed by a Balinese Priest to strengthen and to elevate the healing vibration of the sprays. This ceremony is celebrated under the full moon. There is Palo Santo (sacred wood) from Peru, flowers, incense and candles always involved during production and all the production is handled in glass containers. Production is made under our specific Balipura protocol and always approached under a meditative state. Our products are all natural and haven’t been tested on animals. Water, Grain Alcohol, 100% Pure Essential oils, Bach Flowers, homemade extracts. 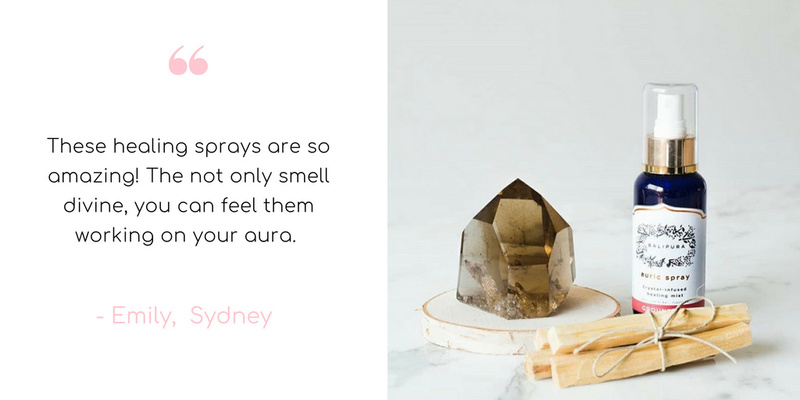 Each spray is handmade with the finest quality crystals (they are cleansed, activated and charged with its original life force) & Certified Organic Pure Essential Oils. 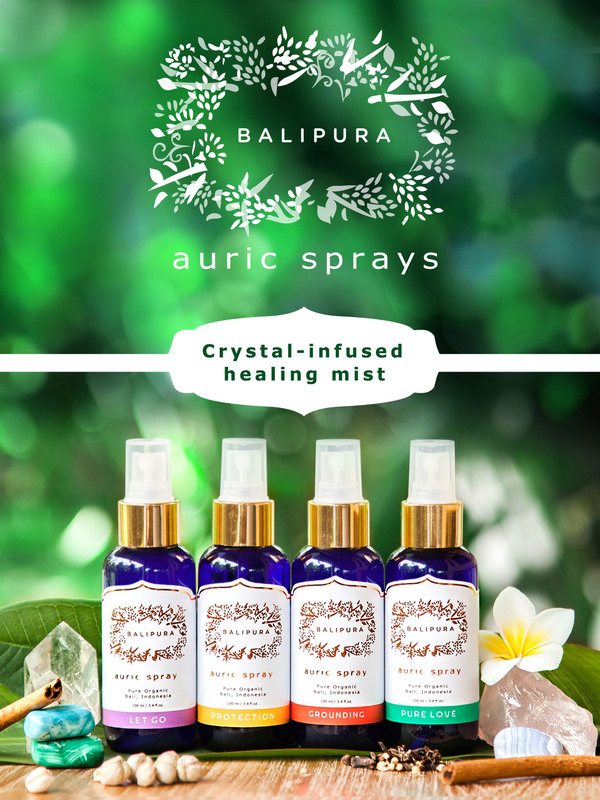 All Auric Sprays receive a special Balinese Ceremony blessing and are immersed in a vibrational & sound-healing process, on a base of energetically cleansed spring water from our own natural spring in the heart of Bali’s volcanic mountains. 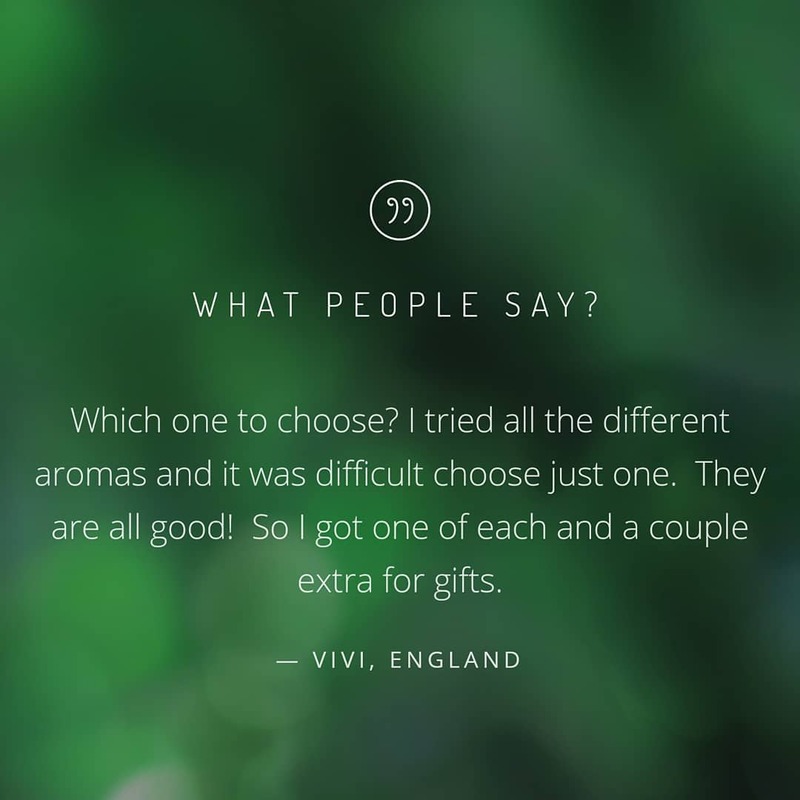 We receive a certificate of authenticity for all the essential oils we use.